Look what happens when your dog gets ahold of your tatting project. I had just finished the second round on the second bootee and put it down for the night. The next morning while I was getting ready for work Sadie came in with it dripping from her mouth. To late to rescue this bootee! She is so curious you really have to put things up where she can't reach them. have three more pairs to make before the end of the year. Two more green and one is going to be mocha and cream. 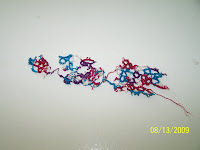 I am using a pattern by Mrs. C.B Platt and size 20 Lizbeth thread in color 113 Jewels. It is so hot out doors that I should be able to get a lot done on e the new bootee today. I spent most of yesterday outdoors working in the yard and garden. I almost have enough cucumbers to make a batch of bread and butter pickles. Just need to get a few more ingredients and I can start the process. Oh that's awful! We had a dog when I was little that liked to shred my mom's pineneedle baskets. terrible shame! you seem to be a good sport about it though. I have the same problem, but with a cat. She steals anything lacey or shiny. I am sorry about the lost booty, but the replacement is beautiful. I love the first pair also.